This is my first of twelve microadventures. If you don’t know what a microadventure is or why I am doing one every month this year, head to my previous blog post explaining the whole idea. Which hopefully might persuade you to join in too..? Basically it boils down to this: committing to getting outdoors either alone or with friends for a small overnight adventure and trying something new, once a month for 2015. 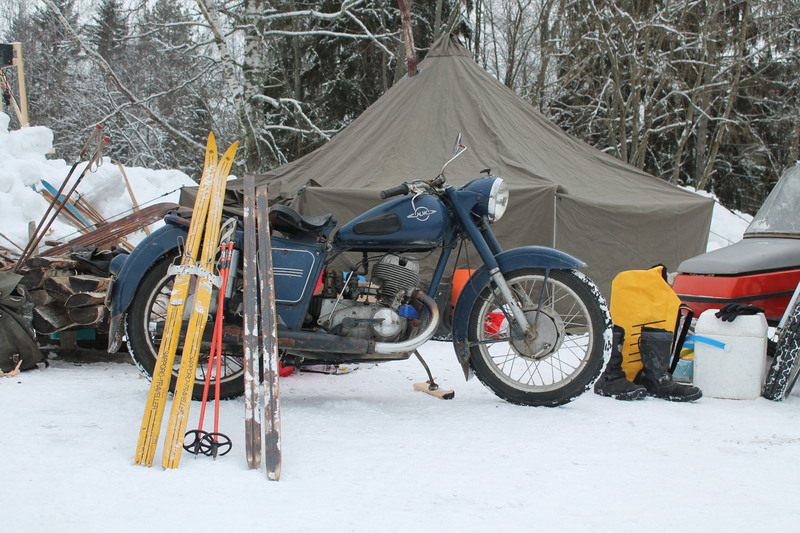 As the title of this post appropriately suggests, the first adventure is a fable of a 24 hour skiing trip shared by an Englishman, two Deutschlanders and an Irish lass – Sinead and the Wild Boyz to you. 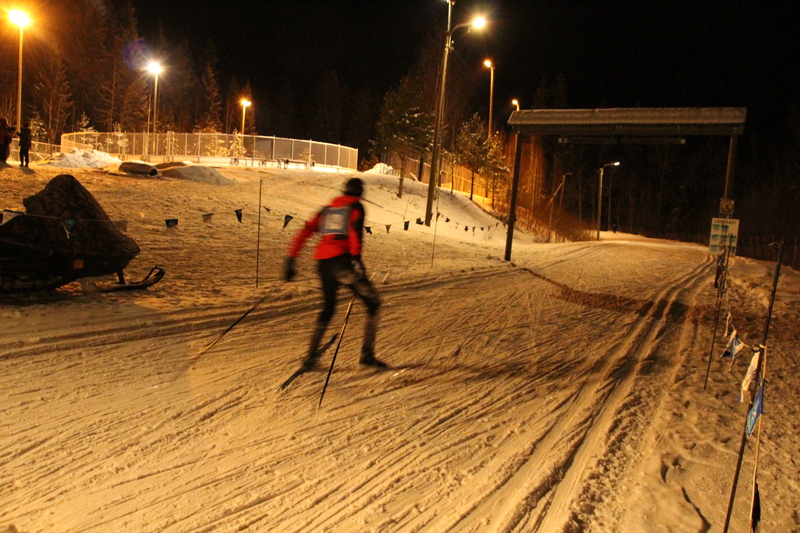 We found out about the event through our tutor Mikko, and I for one was instantly hooked on the idea of having a go. It sounded like a fun, slightly stupid challenge. I assumed the rest of my class would be sharing this childlike desire to enter the race. So after speaking to them about getting a team together I only managed to snare two equally foolhardy Germans. Later with some persuasion we cajoled Sinead to join us, but alas, our sweet talking tactics were not good enough to enlist any others. So a team of 4 it would be. But, we did manage to collar a cuisine de cloggie and a French photographer as support crew. Who kept up moral and made a mean chilli – so huge thanks to them for helping out. 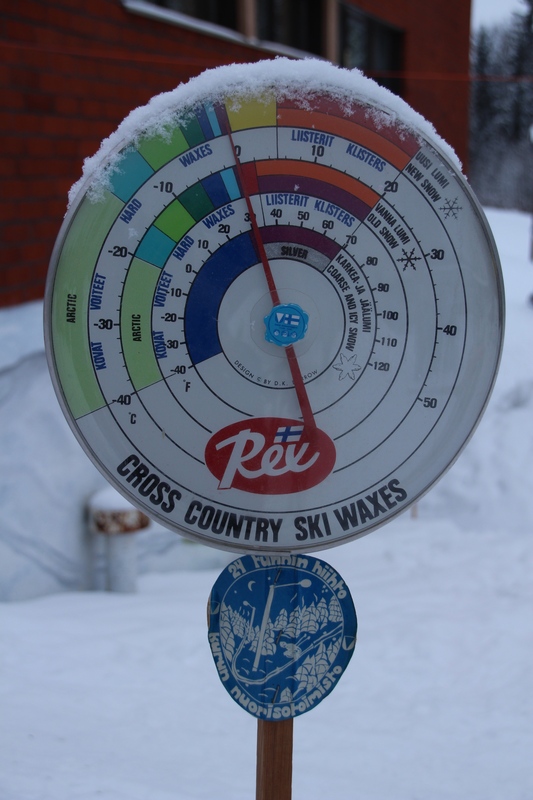 As a collective we joined forces to ski round the local track continuously for the time it takes the earth to spin on her axis. 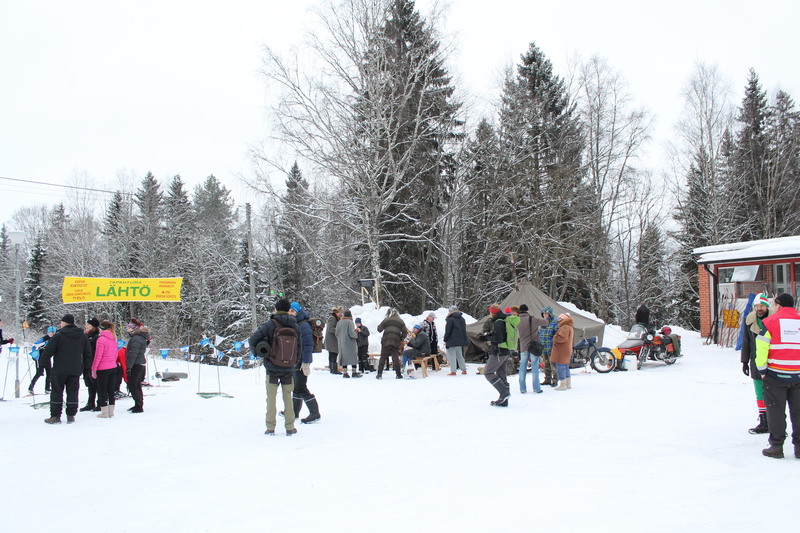 An exciting yearly event for the 3000 inhabitants of sleepy Kuru town. You could have up to 24 people in your team, and could change competitor each lap if you wanted to, by simply touching or tapping poles. 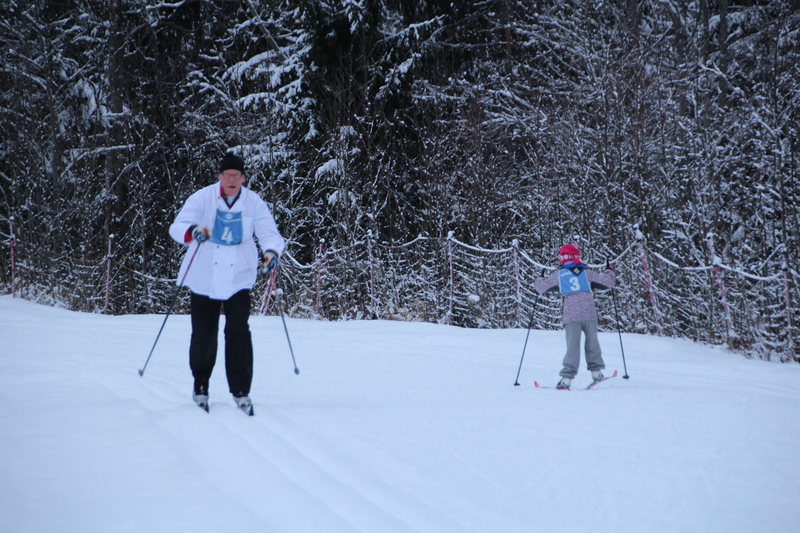 We chose to a combination of 1.5, 3 and 6 hour skiing shifts. 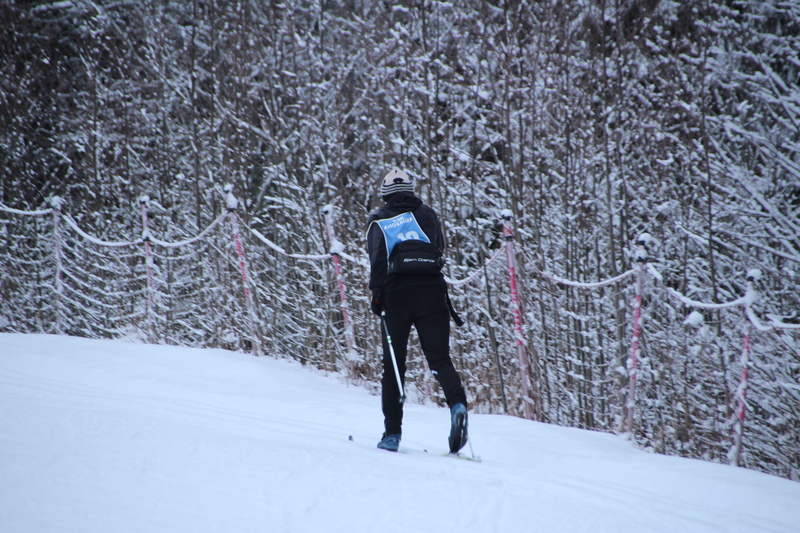 Sinead started first, she didn’t want to ski through the night, so with true Irish grit she chose to ski her share of race – 6 hours – in one go. Absolute beast I know. We turned up at the race early to see her off at 12 noon, on Saturday 24th January. There was a real energy about the place, you couldn’t help but smile at the madness of it all. 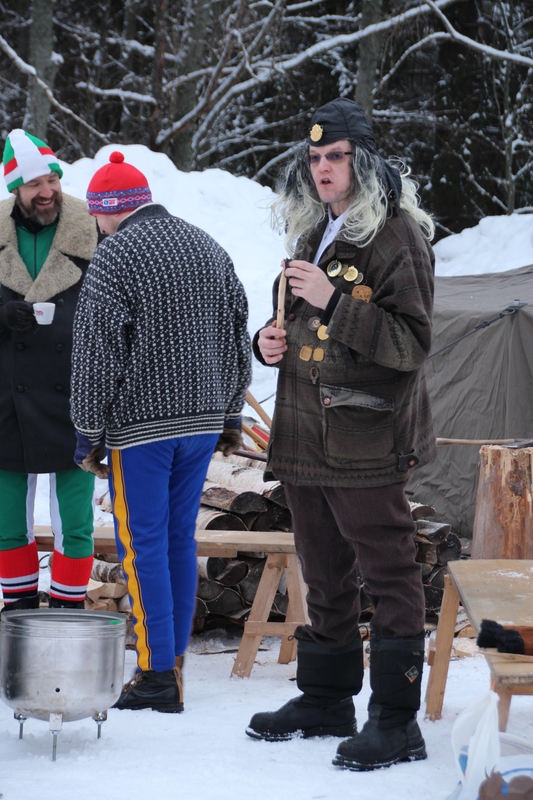 A rabble of skiers and spectators ambled around excitedly, hands juggling skis and poles or cups of hot juice and a sausage. Garish lycra bodysuits clung tightly to their peanut smuggling wearers, a rabble of veteran participators glad in ill-fitting, medal encumbered, patchy moth riddled jackets and big fur hats bounced in on Russian motorcycles, their army tent set up track side always had several team members sat around a crackling fire scorching sausages and laughing heartily. Their gear, probably older than them was either in use or perched nearby. To top this all off, among others, the 90’s classic – Backstreet Boys – Everybody – was blasting out of the sound system. 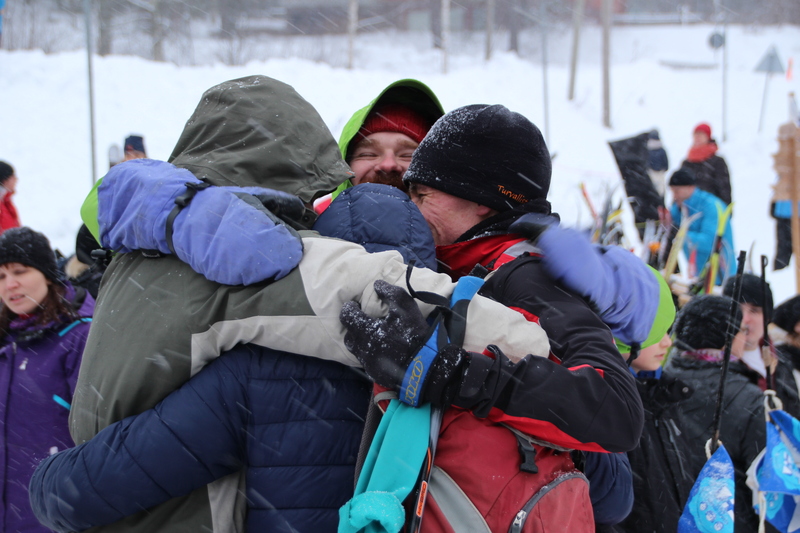 All 14 teams were here to ski and have a good time, and pre ski nerves in the form of boisterous butterfly’s simmered away whilst sharing excited smiles of trepidation with teammates and spectators. This was going to be a fun and memorable 24 hours indeed. 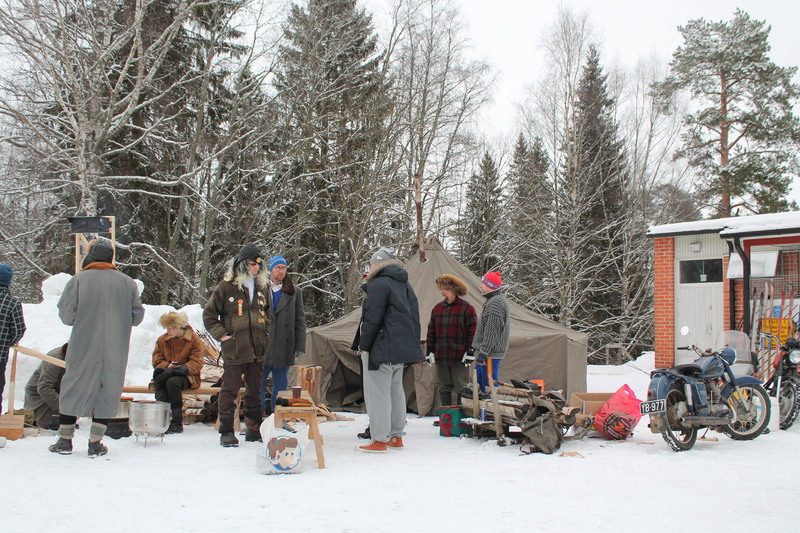 Whilst Sinead was skiing, we set up our own trackside camp. 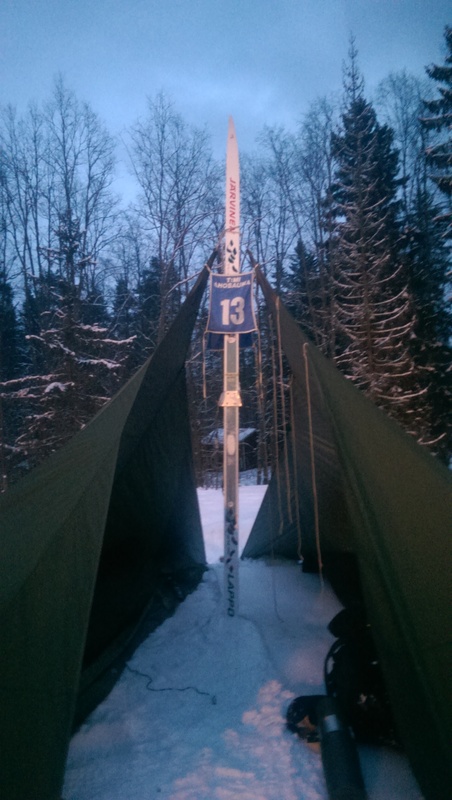 Using one of our forest skis, we assembled two loue tents either side. This meant we could stay track side for the whole race and also duck away for a quick sleep between shifts. 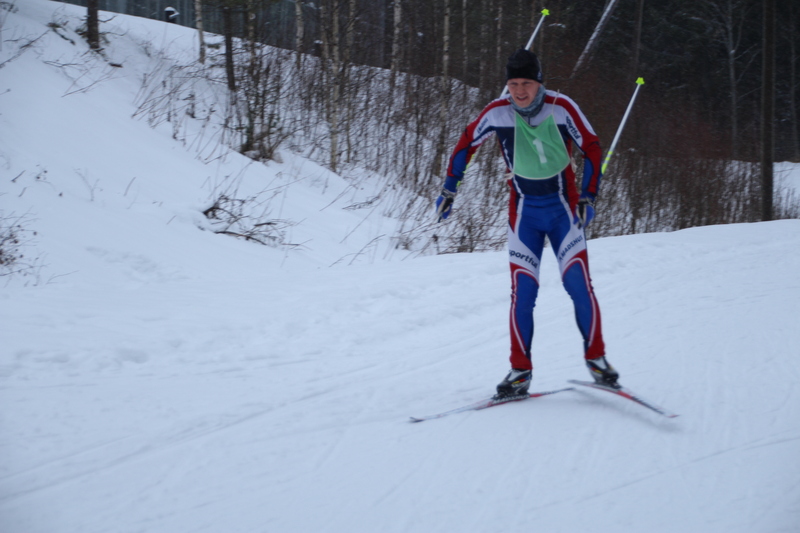 None of Sinead and the Wild Boyz had skied in an event like this before. It was a physical and mental challenge and it felt damn good to cheer Marcus over the finish line at 12pm on Sunday 25th January. As a weary sleep deprived team we shared a big group hug, we had bloody made it! 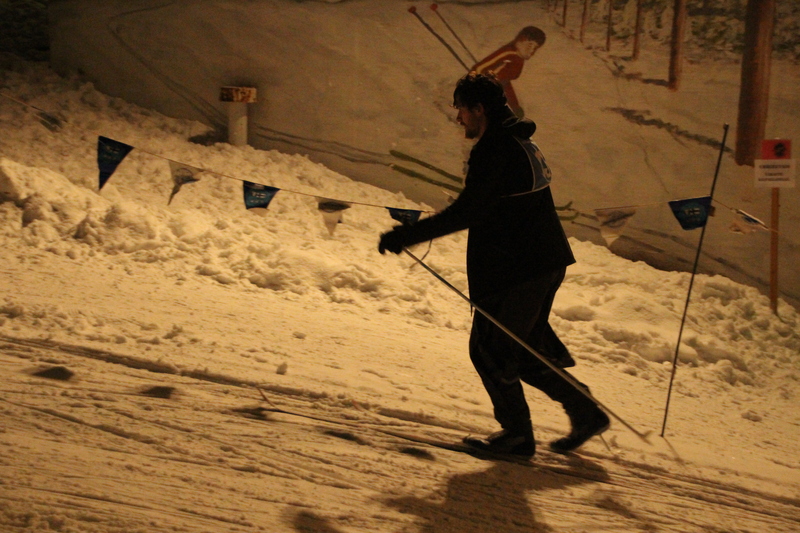 We had skied for 24 hours, encircling the track 102 times between us, covering just over 214 kilometers. But distances, race positions and times were not so important to us – although we did come in an impressive 2nd place (from last!). It was about pitting ourselves against it and seeing how we came out the other side, sharing memories and a palpable sense of camaraderie between 4 friends. 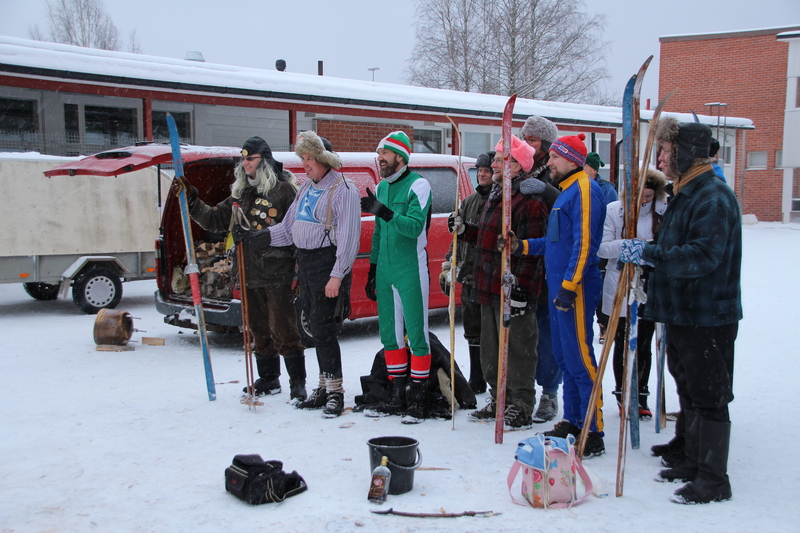 So, during the medal presentation, the mc suddenly changed language to English and announced we were the winners of the wooden spoon – for best effort. 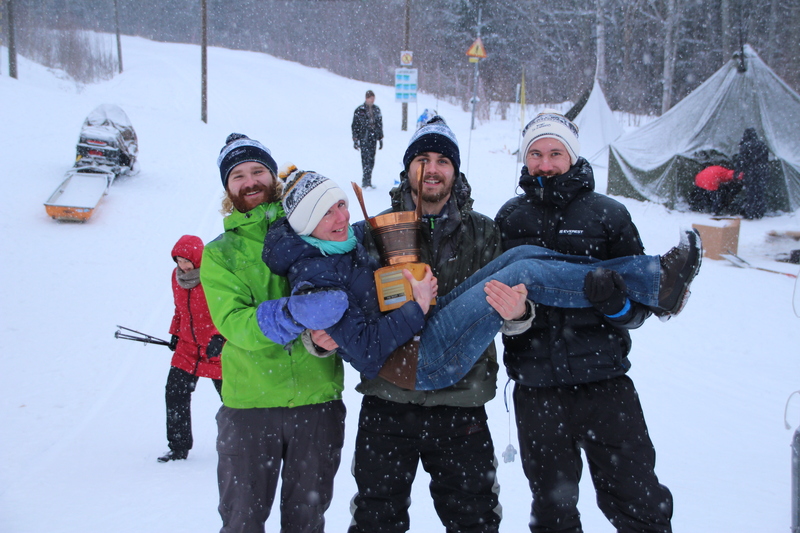 Not only had our little team made it, we had also got a trophy to go with it. A great January microadventure in the bag, 11 more to go. 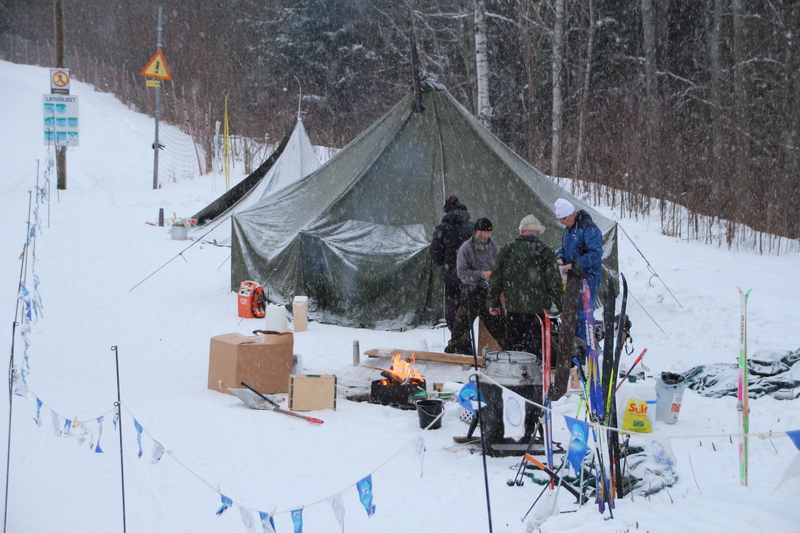 This entry was posted in Adventures, Finland, Monthly Microadventure, Skiing and tagged 24 Tunnin Hiito, Adventure, cross country skiing, endurance race, Finnish Microadventure, Kuru, Microadventure, Microadventures, nature, outdoors, skiing, Ylöjäarven Liikuntapalveiut by mountchris. Bookmark the permalink.